Eating Healthy in the New Year, There’s (Multiple) Apps for That! Wrote an article for the SM Observer on the iPhone 5 and some healthy New Year Apps for it! Enjoy!!! The first month of the year means numerous commitments to age old New Year’s resolution to “Eat More Healthy.” Everyone’s looking for the ability to stay on the right track and, in lieu of Apple announcing this week that customers have downloaded over 40 billion apps, (with nearly 20 billion in 2012 alone), there are a multitude of apps for that! From recipes to foraging How To’s to seafood Watch, Lists Food Apps have become a big business. Apple’s App Store has over 500 million active accounts and had a record-breaking December with over two billion downloads during the month. Apple’s App Store offers more than 775,000 apps to iPhone, iPad and iPod touch users in 155 countries around the world, with more than 300,000 native iPad apps available. App Store customers can choose from an incredible range of apps in 23 categories, including newspapers and magazines offered in Newsstand, Games, Business, Health & Fitness, and Apple’s newest category Food & Drink. So for the New Year’s resolution maker here are some great apps to keep that positive idea going beyond the second week of January. My favorite new app, Wild Edibles is an app for aspiring foragers provides a useful tool in identifying wild plants for human picking and consumption. The app draws on the extensive knowledge of "Wildman" Steve Brill a well-known forager and environmental educator. A great excuse to go for a hike this app includes up to 8 images for each plant with detailed descriptions, photos of similar plants, information on poisonous lookalikes, and medicinal information for natural health. Techniques and methods for harvesting the plants are also included in the app, which has a free "lite" version. After the harvest, recipes are conveniently offered. The search function allows the user to search by season, habitat, edible part, and type. The app covers 165 plants, plus 52 lookalikes, including fruits, nuts, roots, and greens. As foraging becomes increasingly popular this app is designed mostly for the novice forager who needs to avoid unintentionally picking a dangerous lookalike plant. The best piece advice given to the novice forager is to integrate your booty one “weed” at a time until expert status has been received. This App ranges from Free for the “Lite” version to $7.99 in the iTunes store. Truly addictive this free app allows users to scan the bar codes of grocery items and then receive a grade of the nutrition rating of the food. If the rating is too low, Fooducate will then offer a better alternatives. The rating system is based on the amount of processing put into any item, as well as nutritional content. Not every item in the grocery store is available in this app, but developers continue to add new products, and the app is improving day by day. This App ranges from Free to $2.99 for the Fooducate Plus version in the iTunes store. With over 5 million downloads, Epicurious’ Award Winning Recipe App lets you search over 27,000 food and drink recipes, create and e-mail shopping lists, save recipes to a "favorites" list, and browse special featured recipe collection. With both an iPhone and iPad version available, the latter’s larger screen size and faster processing speed helped them take their app to a whole new level, with a gorgeous full-screen "cookbook" view for recipes that makes it even easier to follow recipes step by step. This App is Free in the iTunes store. Seafood Watch from the Monterey Bay Aquarium offers free recent suggestions on ocean friendly seafood and sushi selections. The newest version, with Project FishMap, lets you share the locations of restaurants and markets where you’ve found sustainable seafood. As the ultimate crowd sourcing foodie map grows, you’ll also be able to see what others have found near you. Aquatic Do-Gooders can help map out the businesses and restaurants in an area to create ocean-friendly seafood wherever you are. This App is Free in the iTunes store. As a Vegan I know that sometimes it can be a challenge to find a place where everyone in your party can have a meal. It can be hard for a vegetarian to find a place to dine out, and that that difficulty doubles in you’re a Veg in an unfamiliar city. The VegOut iPhone app can help vegetarians and vegans find a place that will satisfy both their dietary restrictions and their grumbling tummies. The application accesses a database of restaurants that are vegan, vegetarian or vegetarian-friendly. You can search by your current location or enter a custom location if you're planning a trip. And unlike some applications, VegOut is international in scope. Sort results by alphabetical order, distance from your current location or user ratings. You can also view results on a map if you need to get your bearings. The perfect solution for any vegetarian deep in the heart of barbecue country. This App costs $2.99 in the iTunes store. This app wants to know “Are you ready for the challenge?” Expand your palate by exploring a range of delicious, nutrient-dense foods. Learn more about healthy eating and start a conversation with your social networks about your mission to better health. This app features: complete steps of varying difficulty and earn badges through fun and educational Missions, get simple, practical advice on cooking, nutrition, green living, food storage and more. Save your favorites for easy reference, keep track of your accomplishments and brag about them via email, Facebook, and Twitter (not my posting of choice, but fun for those who want to). Naturally you have the ability to ZIP search or your current location to find the nearest Whole Foods Market store. This App is Free in the iTunes store. Exploring a new city can be both exciting and frustrating, particularly when suppertime rolls around. And while chain restaurants are likely to deliver a familiar experience, it's not the same as finding a locally owned dining establishment. The LocalEats app acts as a knowledgeable tour guide, giving you the inside skinny on the best places to eat in towns and cities across the United States. You won't find an Applebee's or Outback Steakhouse in their list, the app doesn't index chain restaurants. But you will find authentic, locally owned restaurants. The app uses the iPhone's GPS receiver to identify your location and pull up restaurants that are nearby. You can also search restaurants alphabetically or by category. If you're only interested in the best of the best, you can choose "Best in Category" to see the town's top restaurants for each cuisine. The app provides links to restaurant descriptions, Web sites and directions. This app also gives users access to dining coupons and discounts to stretch every penny. This App ranges from .99 for the iPhone version to Free for the iPad version in the iTunes store. My friend EJ is going blind. He has a degenerative eye disease called Choroideremia that will slowly take his sight. Most people haven't heard of Choroidermia because very few people actually get it. Unfortunately EJ is one of them. But EJ has one of the strongest hearts I know. He doesn't lie down in a battle. 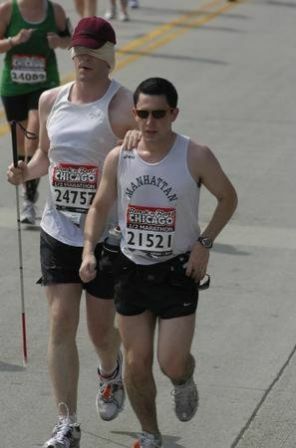 Instead in 2012 he's running 12 marathons in 12 different states blindfolded in the hope of raising $144,000 to be finding a cure for Choroideremia. It's the best New Year's resolution I've heard yet! Now what does this have to do with food you ask? Well other than giving a shout out to an awesome amazing guy, I bring this up because January 1st is a day dedicated to Change. We all plan to be better people and take care of ourselves better by eating "healthier" on January 1st, but for the most part a lot of people throw in the towel a week or two into it. Change is always easy in theory, but when it comes to changing patterns day in and out we realize that's where the true challenge lies. But if you want things in your life to change, you must change things in your life. If you want to eat healthier, you need to become more conscious of what you eat. Every bite has ramifications. But not in the restrictive way that most people think of when they think of "eating healthy." Instead think of EJ who is running 12 marathons. Because every finish line he crosses will be because he put one step in front of another in front of another. Happy 2012! Here's to conscious thinking, eating well, and living out our dreams!! !